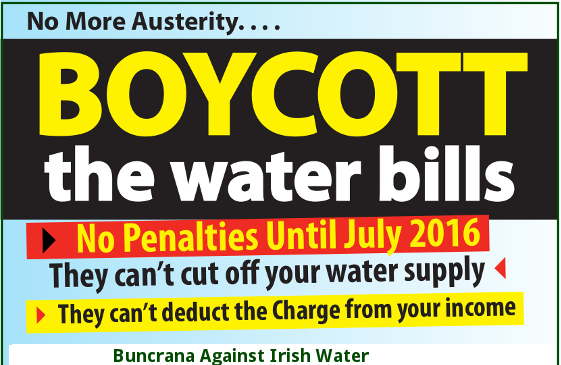 Buncrana Against Irish Water advise all people who oppose Irish Water's charges to join households throughout Ireland and boycott Irish Water bills. Let us support a strong nationwide boycott campaign of non-payment. We understand the problems with non-payment. There is great difficulty and worry about paying bills, not to mention the legal and emotional threats that accompany them. If you are able, let us try to hold out not paying for as long as we can. When Irish Water fail to get enough customers it will cease to exist. There is a good chance that a general election will be called within a year. Irish voters will then have a chance to change this government. We will leave it up to you to decide what to do with the bills but in the end of the day there are 3 choices. 1) You can pay of course. If you take this option we feel you will be supporting the privitisation of our water. This will be inevitable if Irish Water and the government get their way. When it happens there will be an escalation in water charges and your bill could be in the region of €1000 or more per year. Contrary to the belief that a private company will invest heavily in improving water resources, we know from worldwide experience that this is not the case. Profits are their motive, maximum extraction, increased exports and less running costs will be the order of the day. Water companies throughout the world are making enormous fortunes. In England alone in 2013 net profit for water companies was in the region of 2.3 billion pounds. 2) You can destroy the bills. Some organisations are calling for binning the bills, gathering at strategic points throughout the country in a show of defiance. This action was planned before any threats by the government of enacting new legislation to deal with non payment such as giving a semi private company powers to take water charges and fines from wages and social welfare. It is not clear yet whether this is another government threat or if it will actually follow through and enact such controversial legislation. If you decide to return to sender you can download a 'Return To Sender Label' from our web page http://buncranatogether.com/new-page/ scroll down to Return Bill To Sender Label and click on Download. According to Fliuch you should stick this label over the envelope window and post, do not open or write on the envelope. Although Irish Water meter installations will only commence sometime in mid April in Inishowen, we feel it is urgent to let people know about the next phase of our campaign i.e non-payment of water charges. Even though you are not metered, even though you have no contract with Irish Water, even though you were forced, misled into signing a contract you are going to receive a bill. Irish Water, with the help of some recently enacted and intrusive legislation, tell us that they will send out in the region of 1.8 million bills. According to Irish Water's complicated and improvised billing structure your charges will start from 1st January 2015. As far as we can see if metered you will receive 4 bills per year, the first one sometime between April and June. This bill will be for the period January to March and so on. If you are not metered you will be charged a yearly bill of €160, single household and €260 for households with 2 or more people. Appartently registering with Irish Water has now been extended to the end of 2015, however, if you register after June 30th you will miss out on the '€100' allowance. Anyone who does not pay will be given 12 months from the date of receiving the bill to pay or incur a penalty of €30 euro, single household and €60 for households with 2 or more people. If the calculations are right, total cost would be €190 per single household and €320 per household with 2 more people. That's enough of doing Irish Water's publicising for them. Contrary to what they are doing we are trying to inform the public so it can make choices. It is quite a bit to ask people to hold out when this type of money is involved. We don't know what legislation, to beat us with or carrots to dangle in front of us, Irish Water or the Government will come up with next, but we do know that the only way they will get their money is by dragging it out of us.